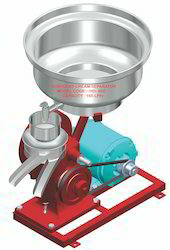 We are the leading manufacturers and suppliers of Hand And Motor Driven Milk Cream Separator Machine. This machine is highly in demand in small and medium scale industries as it produces high output in short duration. We are offering cream separator, self cleaning cream separator, antique cream separator, manual cream separator, goat cream separator, electric cream separator and hand crank cream separator. The highly talented team of our company presents Hand And Motor Driven Milk Cream Separator (HD - 11 EC) 300 LPH to our esteemed clients. This machine is easy to use and is presented at the best rates in the industry. It is available with motor and hand driven body structure and it runs on 0.25 HP Single phase motor available in 110 volts/60 hertz, 220 volt/50 hertz and 220 volt/60 hertz. Additionally, it is presented with a 25 liter tank capacity that produce 300 liter perhour of production. Backed with the team of professionals, we present Hand And Motor Driven Milk Cream Separator (HD -9EC) 165 LPH of higher grade. This machine is provided with 15 liter tank capacity that produces 165 liter per hour of production. There are 22 discs present and are available at the best rates in the industry. It is manufactured using premium grade raw material that is sourced from known and reliable dealers. Also, it is running high in demand as it can be operated manually and electrically. We are dedicatedly engaged in manufacturing and exporting an exclusive range of Hand And Motor Driven Milk Cream Separator(HD-109EC) 700 LPH. 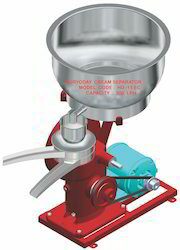 It is widely used in separation of cream and milk in various small and medium scale industries. This machine offer 700 liter per hour of production in a short duration. In addition to this, it is available in affordable rates and is manufactured using premium grade raw material that is sourced from known and reliable dealers. We are the leading manufacturers and suppliers of high grade Hand And Motor Driven Milk Cream Separator (HD - 108 EC) 500 LPH. This machine is manufactured using best quality raw material that is sourced from known and trusted dealers. It can be operated manually and electrically and is available at the industry leading rates to the clients. 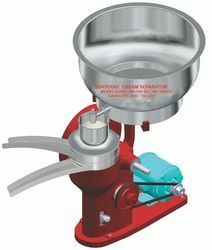 Cream separator is provided in 230 volt and 110 volt and is highly appreciated by the clients for its durability and long service life. Looking for Hand And Motor Driven Milk Cream Separator Machine ?